The Government of Ontario has released it’s fourth report of it’s Poverty Reduction Strategy. By committing to particular indicators, it makes it easy to track the progress (or not) on this strategy. I took the time to compare this report with the 2010 Report. Full implementation of all-day kindergarten, which it is worth reminding ourselves is primarily a poverty reduction strategy, rather than an educational one; and it’s effective. Enhanced access to child care programs. You will notice that although the exact dollar value of the family earnings is the same for 2010 and 2012, the percentage of the poverty line (represented hear as the LIM) has actually decreased. This is because the LIM has increased with inflation, where real wages have stayed the same (or decreased in ‘real’ dollars). This is a clear sign of Ontario falling behind on our commitment to poverty reduction. Going forward, we need to hold the line on what were very incredible poverty reduction goals and strategies laid out by the Ontario Government, and not relinquish them at budget time under the auspices of austerity. I’m all for reducing deficits, but not at the cost of increasing poverty. 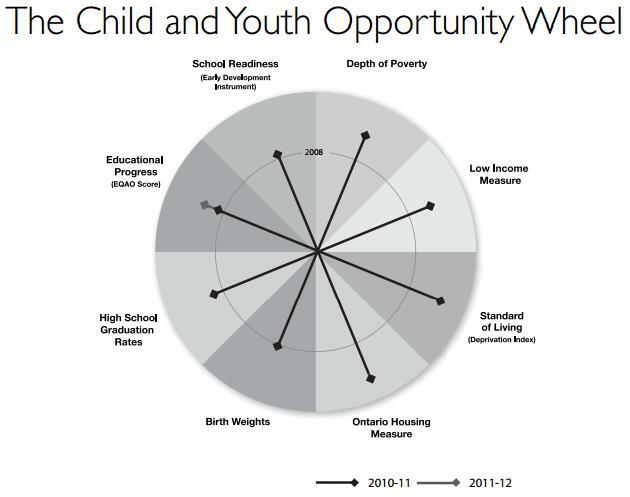 Let’s renew our commitments and see the rate of children experiencing poverty in Ontario decreased by 25%.